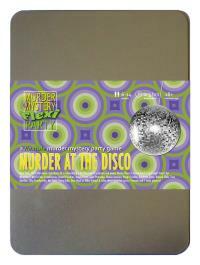 You've been invited to play the role of TONY REVOLTA in Murder at the Disco. New York, 1977. Hot nightclub Disco 54 is hosting a birthday and only the coolest people are there. But before anyone can 'get down on it', nightclub owner Doctor Disco is found dead in the VIP lounge! Join us to find out whodunit! You don’t go anywhere without wearing your white three-piece suit and black shirt. Cuban heels, shiny cufflinks and sleek black quiff complete the look. You grew up poor, the youngest of six brothers raised by just your Mum. Acting and dancing weren’t acceptable professions according to your family so you took up boxing so you could ‘float like a butterfly’. That was fine for a while until you realized all that punching was going to play havoc with your jawline. When Hollywood finally beckoned you were still working as a part-time waiter at an Italian restaurant, something Doctor Disco has never let you forget (or live down)! You all probably recognize me already, I’m Tony Revolta - actor, singer, dancer. The real triple threat. If I want someone dead I just call my agent. But I didn’t want Disco dead. I love Disco. I’m a born dancer for one thing. [Perform your favourite dance move]. That TV crew is here tonight mainly for me. I ain’t givin’ ‘em nothing. Obviously I’ve been in the VIP lounge - it’s basically Tony’s lounge. I dunno the PIN though - Doctor Disco always punched me in.